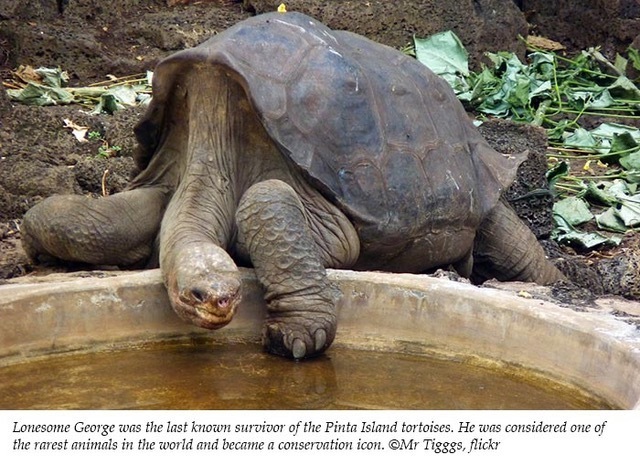 Lonesome George, the famous giant tortoise from Pinta Island in the Galapagos, was a true celebrity during his long life. He was known worldwide by schoolchildren from books and video clips; and because he was the last of his kind and failed to produce offspring, adults came to see him as a symbol for the plight of endangered species everywhere. When he died at about 100 years of age in 2012, he was mourned across the globe. Seven years later, however, George is still teaching us about his now-extinct species. And in the process, he’s also instructing us on how we can live longer and disease-free lives. 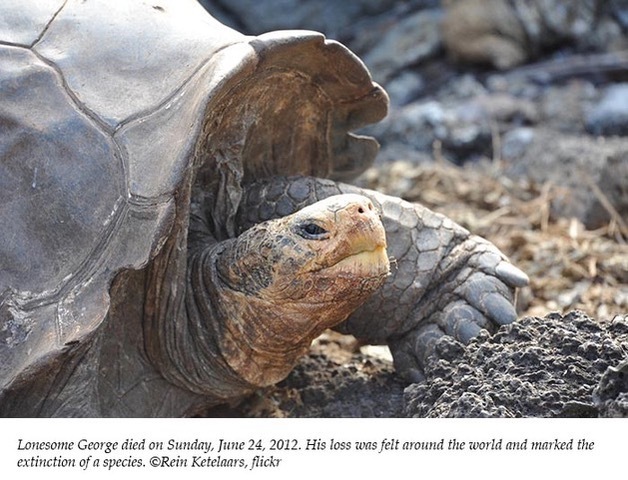 Lonesome George first came into renown in 1971, when a researcher spotted the nearly five-foot-long reptile roaming Pinta Island, one of the northernmost Galapagos Islands. At that time, his species had been thought to be extinct for decades, and he was hailed as the only Pinta Island giant tortoise (Chelonoidis nigra abingdonii) in existence on the planet. George was soon transferred to the Charles Darwin Research Station on Santa Cruz Island, and there he lived out his life. Luckily, two years before he passed away, samples of his DNA were preserved. 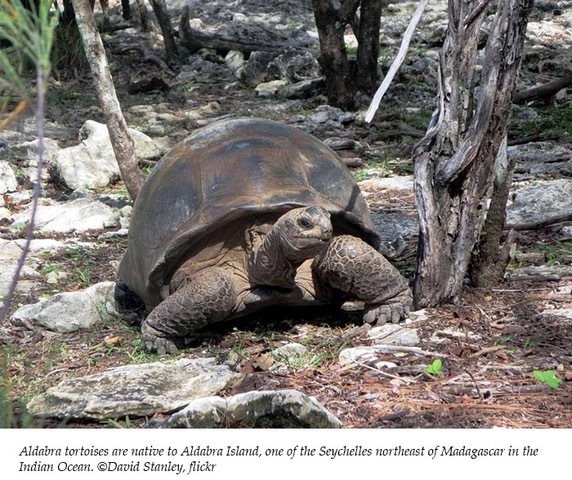 By comparing George’s DNA and the DNA from the related and still existing Aldabra giant tortoise (Aldabrachelys gigantea hololissa)‚ which is native to the Indian Ocean, with the genomes of humans (giant tortoises and humans share more than 90 percent of their DNA) and other long-living animal species—such as naked mole rats, bats and some species of whales—researchers have recently identified a multitude of genetic attributes which help the tortoises to live long lives and prevent cancerous mutations. A report published in the science journal Nature Ecology and Evolution in December 2018 states that this new information may offer fresh insights on healthy aging in humans. Dr. Adalgisa Caccone from Yale’s Department of Ecology and Evolutionary Biology, one of the study’s authors, and her colleagues from Flinders University in Adelaide, Australia; the University of Oviedo, Spain; the Galapagos National Park Service and nine other institutions were able to identify several variants in the tortoise genomes that potentially affect six of the nine hallmarks of aging. They also found that the giant tortoise genome has duplicates of many of the genes found in other animal species which are dedicated to suppressing tumors. As animals age, mutations arise throughout the genetic code from exposure to carcinogens, such as UV rays, and from simple errors as DNA is copied. Mutations in a tumor suppressor gene, for example, can prevent it from fulfilling its function and allow a tumor to begin growing beyond the control of the immune system. Having multiple copies of these genes, however, reduces the risk if any one copy is mutated. The hope is that researchers will be able to replicate these genes in a lab. The authors also found similar expansions of genes linked to DNA repair, the immune system and metabolism that are not seen in shorter-lived animals. These expansions may help giant tortoises to survive food shortages and weather infections, which could also explain their large size and longevity. Lonesome George’s genome also revealed an enzyme variant that suggests possible protections against Alzheimer’s and Parkinson’s diseases. Today, giant tortoises are threatened by climate change, habitat loss, invasive species and poaching. The International Union for Conservation of Nature (IUCN) lists nine species of giant tortoise as critically endangered, three as endangered, six as vulnerable and two as extinct. While it is hoped this research will increase understanding about aging and cancer in humans, the work also needs to benefit the conservation of giant tortoises. We were too late to save George’s species, but geneticists hope the knowledge gained about the Pinta Island giant tortoises’ characteristics and evolution will aid efforts to rebuild other giant tortoise populations where it is still possible. That story is one of hope—for other giant tortoises and for us.